After months of quiet, behind-the-scenes work, the Trinity Conservancy reveals its plans. Get ready to hear a lot more about Harold Simmons Park between the Trinity River levees. The Trinity Conservancy is now moving forward on its development with purpose. Brent Brown, its president and CEO, invited members of the media last week to walk the levees, ask questions, and stare out at the 200-plus acres that will eventually house the park if the money can be raised. It was a quiet morning; the only movement near the Beckley Overlook came from the cars zooming down nearby Commerce Street. The river itself was at 13 feet, about half of what it should be. Later that night, organizers had hoped to launch the first of more than two dozen Summer in the Simmons branded events: weekly organized bike rides and hikes and canoe trips meant to help get the public down to the Trinity. A late afternoon rain doused those plans. It was another reminder that weather will always dictate what happens between the levees, those enormous mounds that protect hundreds of thousands of residents and billions of dollars of real estate from flooding. We now know the parameters and the expected cost of the park. It’s been dictated by the public-private partnership that the City Council charged with overseeing the development and its future maintenance. Harold Simmons Park will span about 200 acres between the Margaret McDermott Bridge and the Ronald Kirk Pedestrian Bridge, a sliver of the total 2,300-acre floodplain. And it will cost around $200 million to deliver; that’s how much will need to be raised in order for the Conservancy to unlock a $40 million gift. It isn’t clear what will happen if that money can’t be raised. Brown envisions the acreage being the city’s ultimate gathering place, for the rich and the poor and everyone in between. He sees it as a place for both education and recreation. He got the top job in March after having served as an advisor to the Conservancy for the past year or so, leaving behind bcWorkshop, the architecture and design firm that he founded. 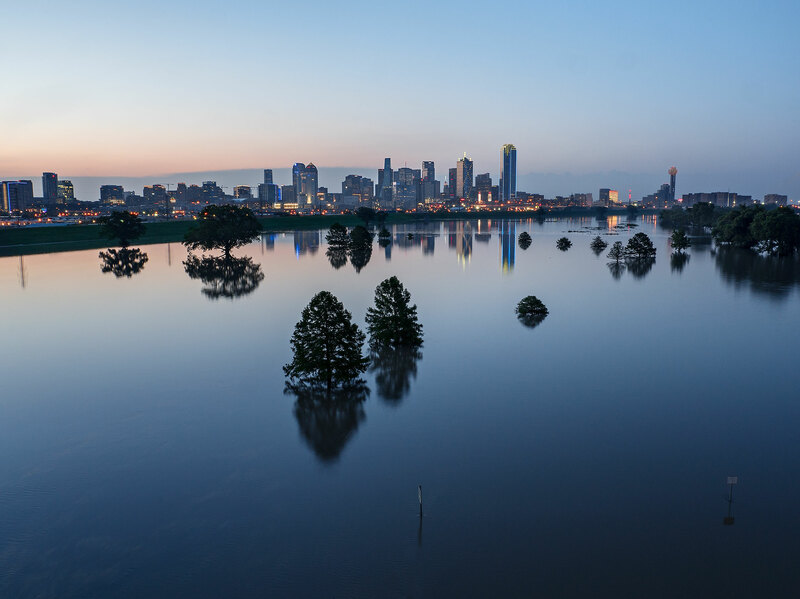 His first four months have included mapping out a plan forward: eight months of public meetings, a call for donations large and small, programmed events to get residents down to the banks of the Trinity to experience what’s there. Much has to be done before formal plans emerge, he said. “That park” is a privately funded capital project. At least that’s how Brown and the Conservancy are approaching it. Harold Simmons Park, named for the billionaire nuclear waste disposal magnate, was born from a $50 million gift from his widow, Annette Simmons. The Conservancy got $10 million up front, but the other $40 million is locked up pending naming rights, establishment of a governance structure to build and maintain the park, and raising enough money to the tune of the Simmons’ family’s “reasonable satisfaction” by next September. All but the last one has been accomplished. We now know the parameters and the expected cost of the park. All of that factors into why Brown says there is no design yet for this park, which is a confusing statement. If you’ve lived in Dallas for any significant amount of time, you’ve probably seen some sort of plan for the Trinity. There have been at least nine variations at different points in time. They once included a major tollway. Another introduced jugglers under an overpass and glued a rock wall to the freeway’s concrete pillar for kids to climb. Another was drawn up by a famous landscape architect and taken to the city’s philanthropic class to raise money. The road is dead—the City Council finally made sure of that last year—but the design remains in flux. Whatever design gets the go-ahead from the Conservancy will have to follow the dictum of the Army Corps of Engineers, because it’s being built in a floodway. In May 2015, a monsoonlike series of thunderstorms filled the Trinity floodway from levee to levee for more than a month. The river, for once, was an actual river, or at least it looked like one. People flocked to the Ronald Kirk Pedestrian Bridge to savor the blessed event. Sundowns became ad hoc street fairs. The idea of a permanent Dream Lake—a notation Kessler made in his 1911 plan for such a body of water in the floodway—is exciting. But when 2015’s Dream Lake receded after 40 days and nights, it left a dead landscape of mud that buried trails, roads, and parking areas with 12 to 20 inches of silt. In addition to the drowned vegetation and silt bars, trash snags as large as 2 acres accumulated with driftwood, thousands of plastic bottles, baby strollers, and an arsenal of sharp objects. The only possible landscape that is beautiful and tough enough to contend with the drought and deluge cycle, and the formidable engineering forces of the floodway, is the original landscape. Re-wilding the Trinity with a blackland prairie and wetland nature project is the safest, most cost-effective, and most creative solution for the Trinity Park. Let’s fast-forward to last August, when the City Council approved moving the responsibility of the park to the public-private partnership. This isn’t unheard of—Houston’s Buffalo Bayou used a similar mechanism to get that project built. So the council OK’d the creation of a local government corporation (an LGC) to oversee the building and managing of the park. The council left with some edicts: kill the road and start with the Balanced Vision Plan. In April, the LGC signed a 40-year contract with the Conservancy that puts it in charge of fundraising, design, and future maintenance. That means that the LGC has delivered marching orders that include delivering a park that costs about $200 million within the 200 acres spanning the bridges. And that’s the park the Conservancy is pledging to build. The foundation will also need to raise the money for maintaining the park, something Dallas’ big-time philanthropic ventures have struggled with. Most recently, the city had to sell naming rights of the Dallas City Performance Hall to an out-of-town donor in order to pay down the AT&T Performing Arts Center’s bank note after its private donations ran out. Brown says that’s a major consideration for what goes into planning the park. The Conservancy has nine public workshops that it is working to schedule, which begin in September. (They will be posted here. A spokeswoman says the Conservancy “would be happy to accommodate” smaller neighborhood groups that wish to meet separately.) It will also include input from at least two committees filled with nonmembers and members of the Conservancy’s board. The Design Committee will be chaired by local architect Robert Meckfessel and include the aforementioned landscape architect Kevin Sloan, the man who essentially brought the concept of re-wilding to town. Michael Van Valkenburgh Associates, the firm behind the starchitect plan that was taken around to the donor class, is the project’s lead landscape architect. There are still raised eyebrows surrounding the project. That the LGC has set the parameters for the park—both cost and size—raises questions about the types of amenities that will be included as well as whether the design will take re-wilding seriously. (Those in favor of re-wilding have said it could be done for the $47 million in leftover bond funds from the 1998 election.) Councilmember Scott Griggs, who represents North Oak Cliff, opposed the formation of the LGC and has long been eagle-eyed and outspoken about the various plans for the space between the levees. He insists upon a simple re-wilding, to move away from amenities that will have maintenance needs in the future, particularly after a flood. Brown said he welcomes the concern and urges the public to attend the hearings and voice their opinions around the project.